In celebration of the museum’s inaugural Cooper Hewitt Lab: Design Access taking place in the Barbara and Morton Mandel Design Gallery through February 15, we are highlighting innovative accessible design from the permanent collection. Designed to help prevent further curvature of the spine, UNYQ Align is an elegant and fashionable scoliosis brace that combines digital design, 3D printing and new manufacturing processes to create a bespoke medical device. Align is a customizable brace made by UNYQ and co-designed by New York design firm Studio Bitonti, known for pioneering new 3D printing techniques. Align provides comprehensive treatment for adolescent idiopathic scoliosis (AIS) patients. 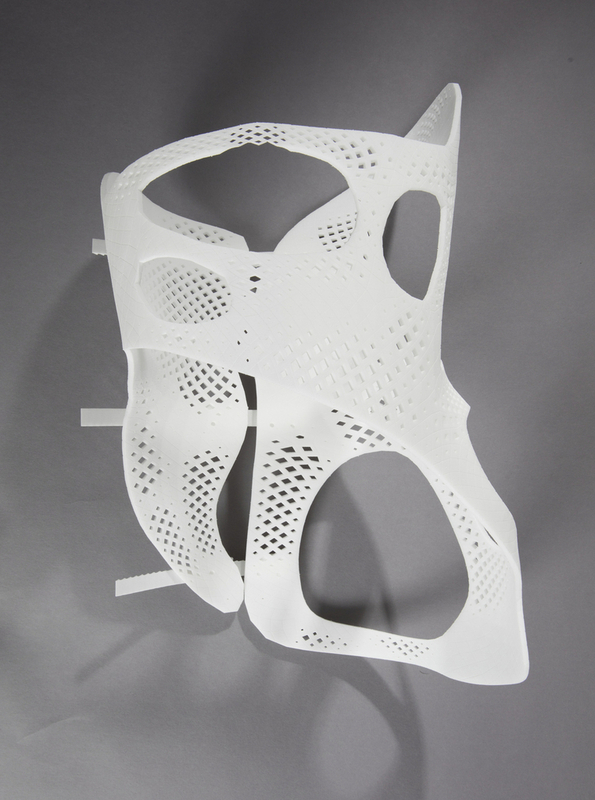 Its comfortable, light, and breathable design is the first of its kind to be developed using a 3D-printed lattice structure, and its beautiful form seeks to eliminate the stigma around scoliosis treatment. Studio Bitonti’s Francis Bitonti has described his design philosophy as “a collaboration with artificial intelligence,” that focuses on “consumer experiences and production.” Indeed, technology and user interface both play a central role in Align’s comprehensive treatment of spinal curvature: the brace utilizes Intel Curie modules, essentially miniature computers, to help patients document wear time, pressure points, and progress during treatment via a smartphone app. Align’s asymmetrical, sculptural skeletal and breathable lattice patterns recall forms found in nature but also underscore Bitonti’s connection to the fashion world, perhaps best expressed by his 2013 design for a black seamless 3D-printed gown for celebrity Dita Von Teese. Align shows how contemporary designers are integrating design with technology to advance the healthcare industry and create highly personalized and effective medical treatments. “Francis Bitonti,” Studio Bitonti, accessed February 13, 2017, http://studiobitonti.com/about-francis-bitonti.